Yikes, how did it get to be Wednesday already? Oh right, I remember. I took a Kumihimo class with a friend of mine at my favorite local bead store on Monday and that fun lasted almost all day. Then, I spent yesterday trying to catch up. So here I am today all primed and ready for Bead Table Wednesday! It rained ALL weekend here, meaning we were stuck in side ALL weekend. The gloomy weather did very little for my motivation, but when we had to unplug all the TVs and computers for fear of lightening strikes, I decided it might be best to get in the craft room and create. With low motivation on my side, earrings seemed like the perfect choice. 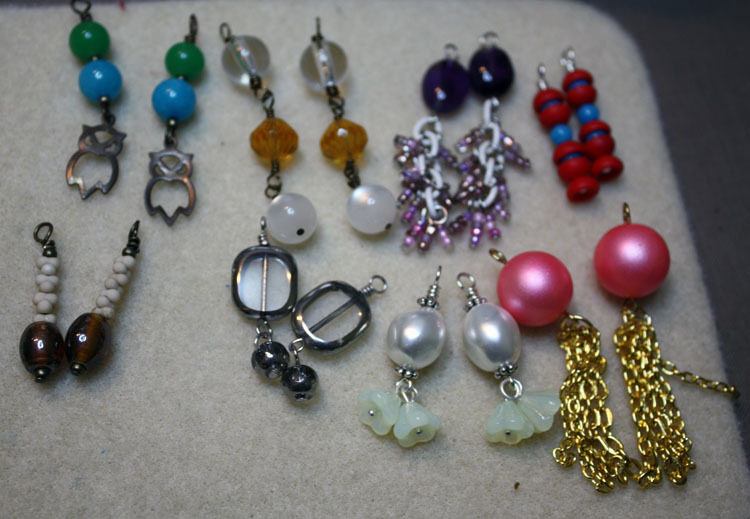 I've even got a few more beads set aside to make into earrings as well. You can see the six other pairs of beads that want to be earrings. As I said, on Monday I took the Kumihimo class. Actually, the class was supposed to be something else, but since it was just my friend and I talking it, the shop owner (who is good friends with MY FRIEND) persuaded us to try Kumihimo. Oh my goodness, look what I made! These are just glimpses of the three patterns I've made. They're still incomplete as I have finished the ends yet. Perhaps it wasn't just the class that has me trying to catch up. . . .there's something to ponder. Lastly, yesterday afternoon we visited with my mother-in-law and she mentioned that she was donating a bunch of arts and craft supplies, mostly quilting supplies. She asked if I was interested in any of it. At first I told her no, but then I realized that there might be some buttons. So I asked. Before long, she had pulled out this large tin. 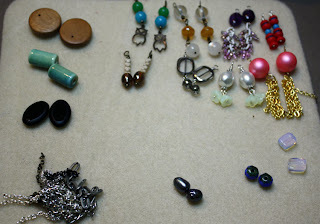 Buttons, button cards, beads, fasteners. . .OH MY! I still haven't sorted through it. Dang Kumihimo pulling my attention away from the BUTTONS!! Before I head out, here's a heads up that I've got a few more items in the On Sale section of my CraftyHope Etsy Shop. That's it for me. I've got plenty on my plate to work on. Here's hoping you enjoy your day! That Kuhimono is so cool, not enough time to try something new!!!!! 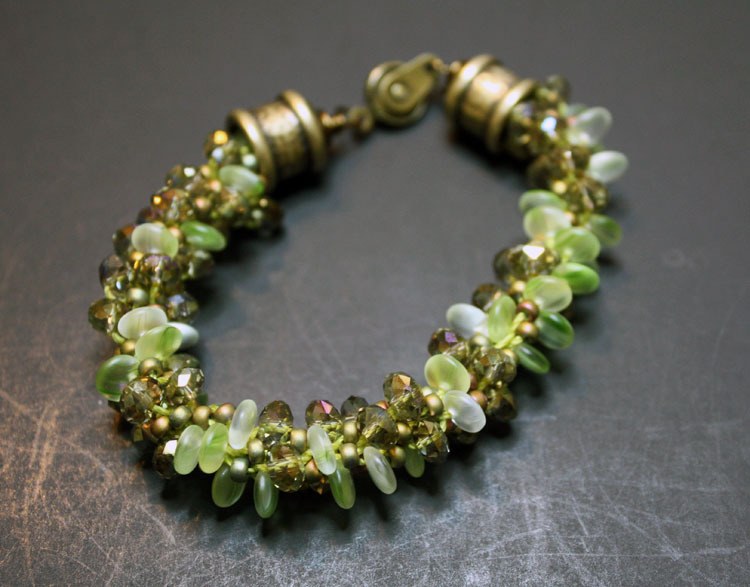 I absolutely LOVE that green Kumihimo bracelet, Hope. Wowzers! Linda- Thanks! You should have seen the pretty multi-colored one my friend Kate made too. Somehow, we spent four hours in the bead store and it felt like one!! Time flies and all. I bet you are happier than I am that the rain has moved on for the time being. Love your bracelets the one you made in class is gorgeous! 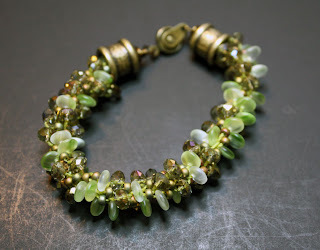 I am self taught in Kumihimo I have not tried using beads yet. I love your kumihimo bracelet! Or should I say bracelets! It really is addictive, but you end up with such cool stuff. I heard about all the rain you all had. Pensacola supposedly got 22 inches?! Goodness! Glad it's stopped for you. Those are gorgeous! and I love that button stash!